The grand jury will meet Tuesday, Jan. 31, through Thursday, Feb. 2, at the Oklahoma Attorney General’s Office, 313 NE 21. The last session was held in November 2011. The grand jury did not meet in December. The state’s 13th multicounty grand jury is led by Assistant Attorney General Charles Rogers, chief of the AG’s Multicounty Grand Jury Unit. Thus far, grand jurors have returned 13 indictments, involving 14 defendants, in cases filed in Cleveland, Harper, Pittsburg and Oklahoma counties. 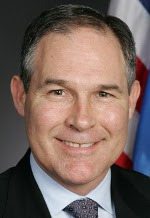 The multicounty grand jury was requested by Attorney General Scott Pruitt and approved by the Oklahoma Supreme Court on Jan. 27, 2011. Grand jurors meet to hear testimony two to three days each month. All grand jury proceedings are closed to the public. 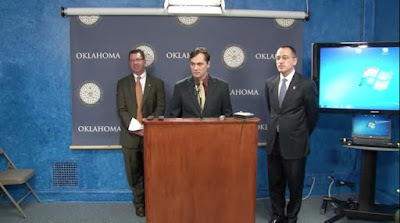 OKLAHOMA CITY (January 25, 2012) – Seeking to increase voter participation, state Rep. Josh Cockroft has filed legislation that would place all local school board elections on the November general election ballot. Currently, school board elections are held on the second Tuesday in February or on the date of the presidential primary every fourth year. House Bill 1544 would place all school board elections on the second Tuesday of November in odd-numbered years and the first Tuesday after the first Monday in November of any even-numbered year. The legislation also changes the terms of school board members so that every board member in Oklahoma serves a four-year term with elections staggered every other year. Currently school board members have terms of three, four, or five years, depending on the size of the school board. Cockroft noted growing support for moving school board elections to November, including a September 26, 2011 editorial in The Oklahoman (“Moving school board elections might help counter voter apathy”) and a Journal Record column by Oklahoma City University law professor Andrew Spiropoulos (“Taking back control of our schools”). Lt. Gov. Todd Lamb has also endorsed the proposal. OKLAHOMA CITY – Oklahoma’s tax credit system would undergo widespread reforms under a plan outlined by House Republican leaders last week. “A tax credit should benefit taxpayers more than it costs them. Period. That hasn’t been the case in Oklahoma, but under this plan, it would always be the case,” said Rep. David Dank, R-Oklahoman City, chairman of the joint legislative Task Force for the Study of Tax Credits and Economic Incentives. Dank said meaningful tax credit reform is an important first step for the Legislature to take as it considers reducing and phasing out the state’s personal income tax. “We need to remember that we cannot accomplish real tax relief for all Oklahomans until we put an end to the costly sweetheart deals that have been handed to a very few in the past. Those giveaways cost us hundreds of millions of dollars each year. Ending tax credit abuse is one vital ingredient in assuring lasting tax relief for all,” Dank said. Requiring all future tax credits and all credits placed on moratorium to meet the constitutionally-required criteria and receive legislative approval in order to be enacted or removed from moratorium. If all the reforms are enacted, all tax credits placed on moratorium would have to be brought back one-by-one by affirmative votes of the Legislature under criteria that would be in the state Constitution. Future credits would also require legislative approval and would have to meet the constitutionally-required criteria. Steele plans to seek a constitutional amendment that would place the tax credit criteria adopted by the task force in the Oklahoma Constitution. House Joint Resolution 1089, by Steele, would send the criteria to a vote of the people in November. If approved, the criteria would be placed in the Constitution. No tax credit could be enacted within the final five days of any legislative session. House Bill 2978, by Dank, would statutorily enact the criteria. House Bill 2976, by Dank, would extend the tax credit moratorium that has been in place since 2010 for another two years. The extended moratorium only applies to tax credits. It does not apply to tax incentives such as the Quality Jobs program and certain engineering and oil and gas incentives that Dank said have adequate safeguards and produce net economic gains that exceed the cost of the incentives. “An extended moratorium gives the Legislature additional time to consider the worthiness of each individual tax credit and to put in place specific criteria the task force believes must apply to all tax credits, be they existing or future proposals,” Dank said. HB 2979, by Dank, would end transferability of tax credits. “Transferable credits are bought and sold like poker chips by folks who’ve provided zero services to the state. This practice was identified by the task force as perhaps the most constitutionally questionable aspect of the entire system. It must end,” Dank said. House Bill 2977, by Dank, would extend the Task Force for the Study of Tax Credits and Economic Incentives for another year, until January 2013. “It benefits us to have the task force continue the analysis it started last year and serve as a watchdog as this reform process plays out over the next few years,” Dank said. Rep. Earl Sears, the House Appropriations and Budget Committee chairman, said the reforms will have a direct benefit on the FY 13 state budget and future budgets. 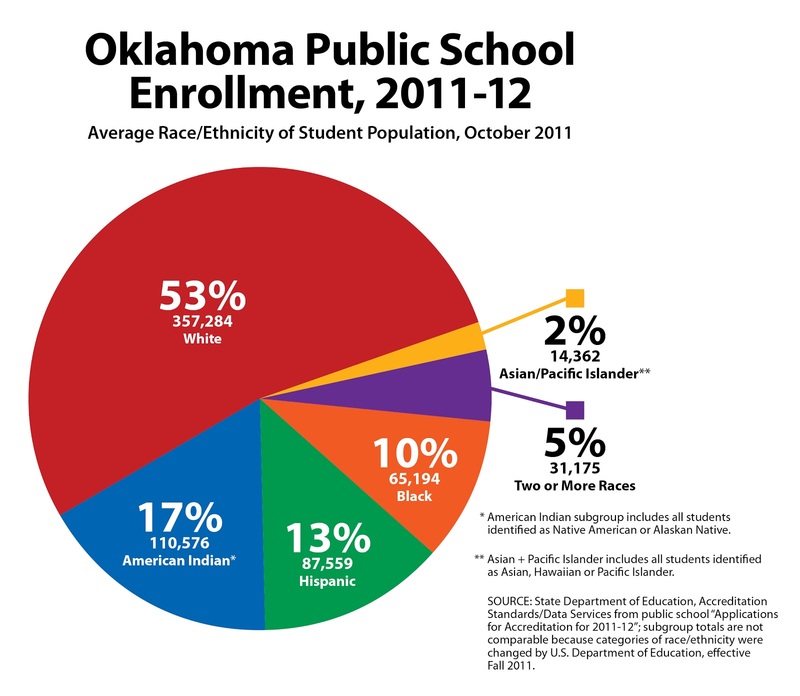 Oklahoma City - Governor Mary Fallin has declared the week of January 23, 2012 "School Choice Week" in the State of Oklahoma. Fallin stated in her proclamation, "[A]ll children should have the 'right' to attend the highest-quality schools possible." Fallin recognized in her proclamation that school choice is a bipartisan issue. She also mentioned that there are great teachers in traditional and charter public schools and in private schools who are committed to educating children. OKLAHOMA CITY – House Republican leaders last week unveiled another round of policy proposals designed to make government more efficient and fiscally stable. Next session, Rep. Jason Murphey and other House Republicans will carry a series of government modernization proposals to continue consolidating and improving duplicative or ineffective state services, while Rep. Randy McDaniel will carry proposals to continue reforming the state’s fiscally unstable pension systems. The proposals are part of the House Republican commitment to fiscal conservatism, saving taxpayer dollars and improving efficiency across state government. Murphey, chairman of the House Government Modernization Committee, noted that legislators “cleared the deck” in 2011 by passing more than 20 pieces of government modernization legislation that were later signed into law by Gov. Mary Fallin. state House Speaker-designate T.W. Shannon, R-Lawton, will carry legislation requiring reforms to the management of state assets. Murphey will carry two bills focusing on purchasing reforms and transparency. An example of a government agency performance matrix can be found at track.dc.gov. Steele will carry a follow-up to House Bill 2140, last year’s government agency consolidation bill. The follow-up bill, HB 3053, would consolidate the Merit Protection Commission and State Bond Advisor into the Office of State Finance and rename OSF the Office of Enterprise and Management Services. HB 3053 would also consolidate the Oklahoma State and Education Employees Group Insurance Board and Employment Benefits Council Board into the Oklahoma Health and Wellness Board. Steele noted that as a package, the government modernization legislation of the two-year 53rd Legislative Session is expected to generate hundreds of millions of dollars in savings. 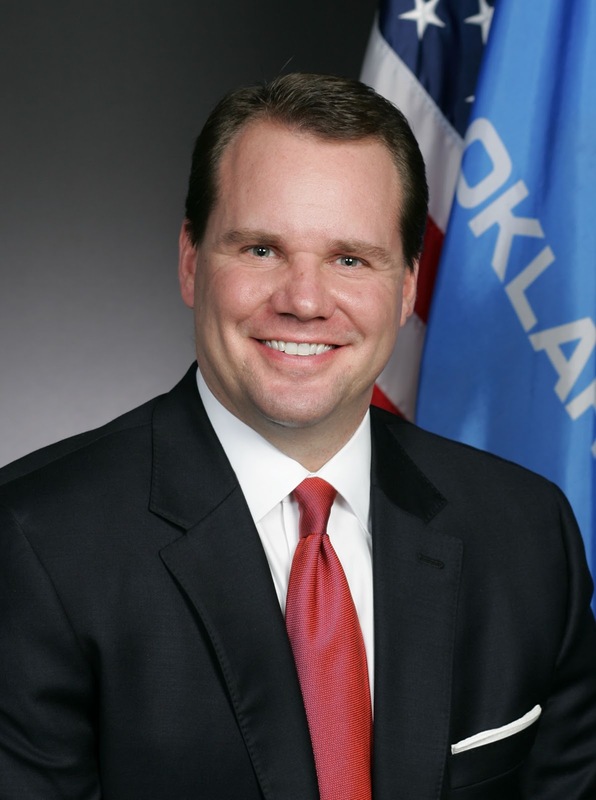 “These reforms are huge parts of our larger effort to find savings across government so we can lower the tax burden on all Oklahomans,” Steele said. McDaniel, chairman of the House Pension Oversight Committee, noted that while last year’s pension reforms shaved more than $5 billion off the state’s unfunded liability, more needs to be done to further stabilize the state’s pension systems. “The goal is to put all our systems on a sustainable path, which would be a notable accomplishment for public workers and taxpayers alike,” McDaniel said. Much of last year’s pension reform legislation focused on the pension systems for teachers, state employees and judges, so McDaniel will carry legislation this year to improve the fiscal stability of the firefighter and law enforcement pension systems. McDaniel will also file a resolution seeking a constitutional amendment that would require more accountability in future pension system decisions. “The constitutional amendment contains the fundamental principles of proper pension oversight. 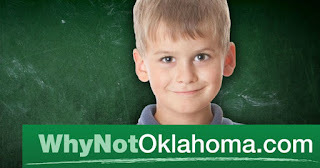 We need a higher law that takes into consideration the future generations of Oklahomans,” McDaniel said. (4) Require funding standards and practices to be established before additional benefits are authorized. OKLAHOMA CITY - Lt. Governor Todd Lamb published his 2012 Policy and Issues Report last week. The report contains ideas, advice and suggestions from Oklahomans from every corner of the state. Attendees of Lamb’s town hall meetings have included people from all walks of life according to the report. The report is a distillation of what Lamb has heard from those who have attended his meetings. 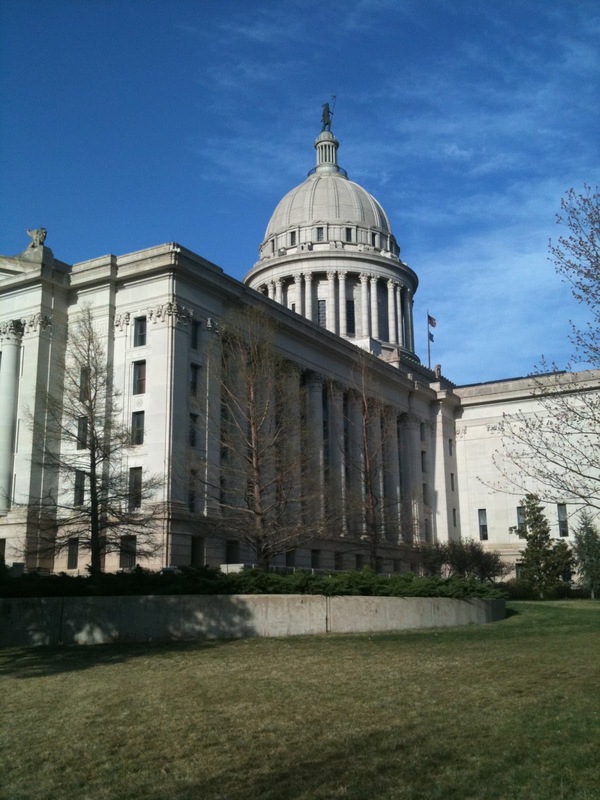 The report has been presented to Governor Mary Fallin and legislative leaders before the 2012 legislative session begins. The report is divided into two parts. The first is Lamb’s vision for the future of the state. The second contains the many ideas gleaned from his conversations while traveling the state. The income tax, education, water and the creation of jobs are among the several topics covered in the report. Lamb says the report is intended to spark “further debate and discussion” by legislators as they look for ways to make Oklahoma more competitive economically. An online copy of the report can be obtained on the Lt. Governor’s website. 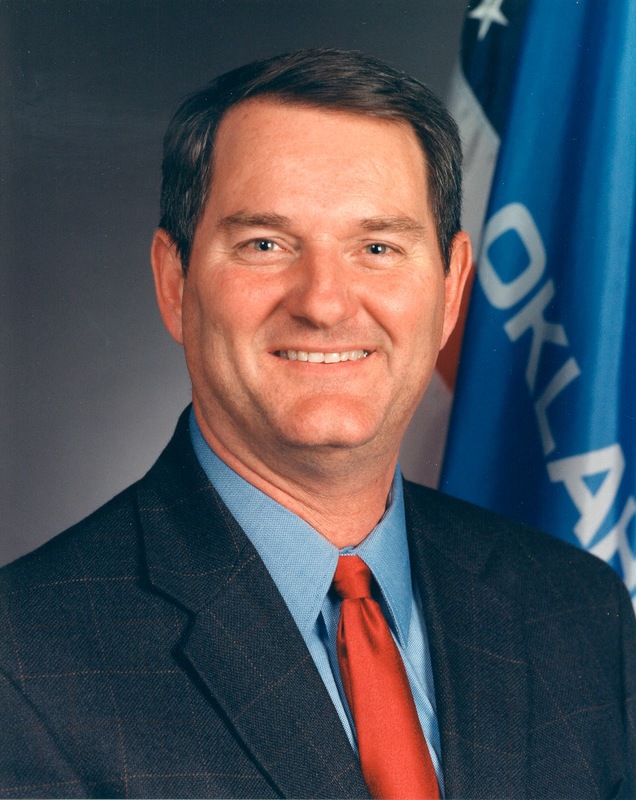 OKLAHOMA CITY – State Rep. Danny Morgan announced earlier this week that he has decided not to seek reelection. He will complete his current term in office, which runs through Nov. 1. With term limits in place, Morgan would have been eligible to run for office for another two-year term. Morgan, 52, said the decision to step down at the end of his fifth term in office was difficult to make, but in the best interests of his family and his family business. Morgan served as the Mayor of Prague prior to running for state representative in House District 32, which encompasses parts of Lincoln and Creek County. Beginning in 2007, Danny served as the Democratic Minority Leader in the House of Representatives. He currently serves on the House Economic Development, Tourism & Financial Services Committee, the Energy & Utility Regulation Committee, the House Ethics Committee, and the Insurance Committee. He was also appointed by the Speaker of the House to sit on the newly created Joint Committee on Federal Health Care Law and the Joint Legislative Task Force on the Grand River Dam Authority. He noted that he has especially enjoyed working with his legislative colleagues and leaders from all over the state to create public policy to better the lives of Oklahomans. Morgan plans to return full-time to his position as President of the family-owned Morgan Well Service, Inc.
Danny was married to the late Debbie (Hicks) for 25 years and together they have two children, Zachary and Danielle. OKLAHOMA CITY – At the conclusion of the filing process this Thursday representatives had introduced 962 bills and 26 joint resolutions while senators introduced 972 Bills and 45 joint resolutions. 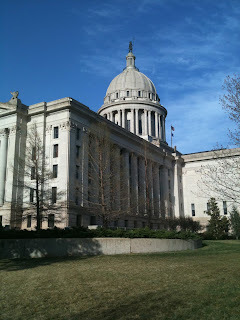 The deadline for legislators to file bills for the upcoming 2012 session was 4 p.m., January 19. These numbers do not include carryover bills. 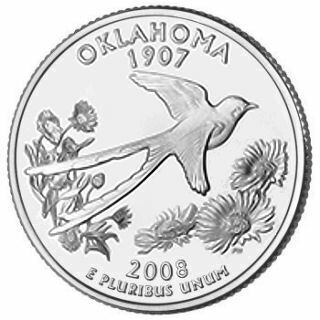 Carryover bills are bills that are introduced during the first regular session of the Legislature, the 2011 session in this case, and are still available during the second regular session. In 2011, the House reported that 1,168 substantive bills and 41 joint resolutions were filed. The Senate introduced 976 substantive bills and 45 joint resolutions by the deadline last year. The Senate has 753 bills and 41 joint resolutions carried over from the 2011 session while there are more than 500 bills and 60 joint resolutions carried over in the House. Appropriations bills are not subject to the deadlines pertaining to substantive bills. The 2012 legislative session officially begins Monday, February 6. OKLAHOMA CITY – General Revenue Fund collections hit a high note to end 2011, recording double-digit growth in December and for the first 6 months of the current fiscal year, Office of State Finance Director Preston Doerflinger announced Tuesday. "We had the best two months of the 2012 fiscal year in November and December, putting an exclamation point on our recovery from the Great Recession," Doerflinger said as he released the OSF's monthly General Revenue Fund report. In December, total collections grew by 19.3 percent over the same month a year ago, while beating the official estimate by 16.6 percent. That came on the heels of November's report showing growth of 22.6 percent and 18 percent, respectively, for that month over November of the prior year and the estimate. "As we look toward the second half of the fiscal year, it is unrealistic to expect that such dramatic increases in receipts will continue on a month-to-month basis," said Doerflinger, secretary of finance in Gov. Mary Fallin's cabinet. "But all signs point to our economy continuing to outperform other states in our region and the nation as a whole." "A big reason for this," he continued, "has been the mini-boom in the oilfields, which has generated economic activity throughout our economy and contributed to our growing manufacturing base. 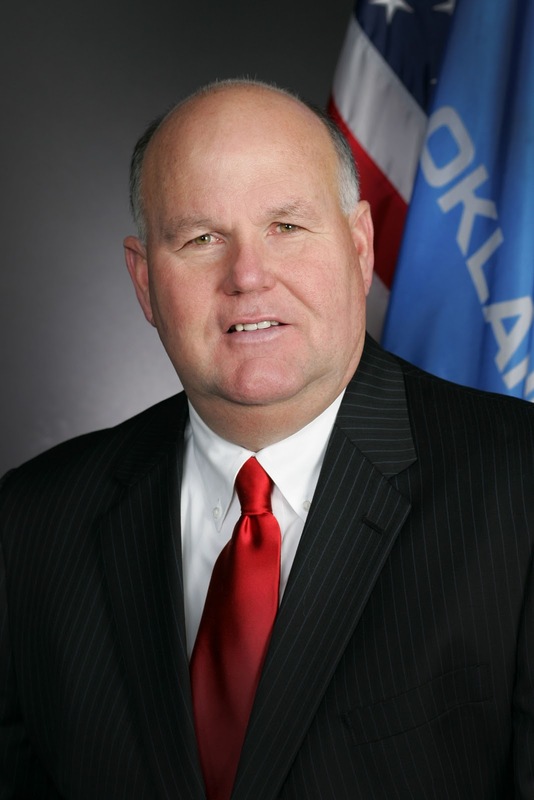 Oklahoma Auditor & Inspector Gary Jones, in a video interview with CapitolBeatOK, has summarized findings of a special audit investigating questions raised about the travel claims of a former Assistant Superintendent of Public Instruction. The auditor and his staff concluded that there was evidence of possible falsified claims, and other concerns. Other issues were found that have triggered a broader inquiry, Jones said in an interview this week. Jones explained that the investigation was undertaken at the request of Superintendent of Public Instruction Janet Barresi, who now runs the state Department of Education. The special audit covered the period July 1, 2008 through June 30, 2011. In the interview, he also provided a broad outline of other audits he is pursuing. Six of the new report’s “objectives” touch upon the work of Misty Kimbrough, a former Assistant Superintendent of Public Instruction. The final report from Jones pointed to what appear to be significant areas of concern that could become the basis for further action, including another audit report in 30 to 60 days. Call to order and roll call – 4:00 p.m.
Reconvene, call to order and roll call – 9:00 a.m.
OKLAHOMA CITY – Governor Mary Fallin today announced the appointment of Joy Hofmeister to the Oklahoma State Board of Education. She will serve on an interim basis pending Senate confirmation. Hofmeister is replacing Philip Lakin, Jr., who resigned. She will serve the remainder of Lakin’s term through April of 2015 as a member from Congressional District 1. Hofmeister is a former public school teacher who currently serves as the CEO of Kumon of South Tulsa, a local franchise of the international firm that provides math and reading enrichment to children. She serves on the board of directors for the Jenks Public Schools Foundation, is participating in the Jenks Select Committee for Study of School Finance, and has previously worked on the Math Textbook Adoption Committee, also for Jenks Public Schools. Hofmeister has significant experience working with Special Education teams and students on an Individual Education Plan (IEP); and has also participated in the Trends in International Math and Science Study (TIMSS) research testing. Hofmeister has a bachelor’s degree in Education from Texas Christian University, as well as teaching certificates in English and Elementary Education. She lives in Tulsa with her husband, Gerald Hofmeister. They have four children. 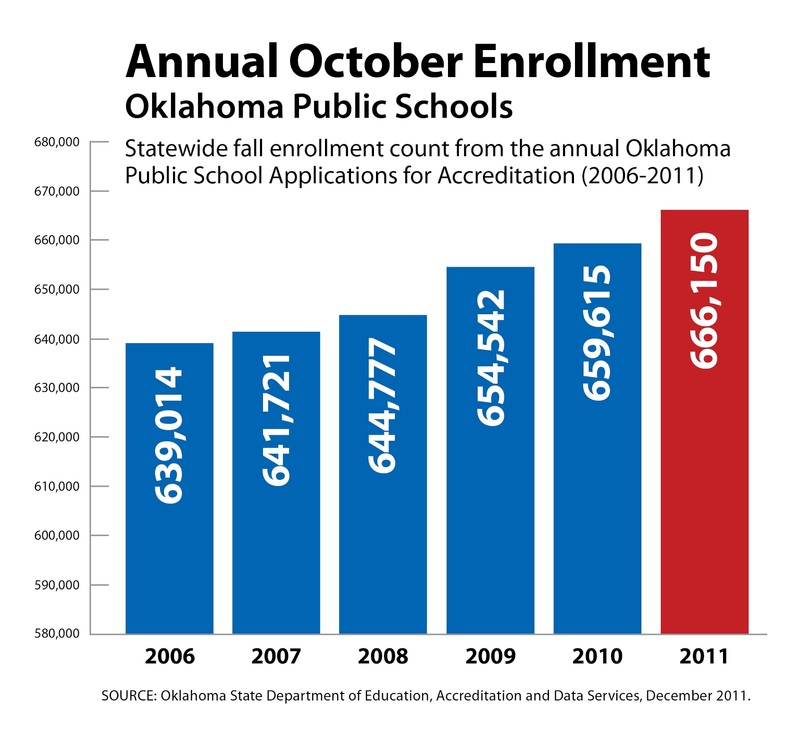 OKLAHOMA CITY (Jan. 11, 2012) – Annual enrollment numbers provided to the State Department of Education by each public school district and charter school site in Oklahoma, show that pre-Kindergarten through grade 12 enrollment for the current school year is 666,150 – an increase of 6,535 students over the 2009-10 school year and 27,128 more students than five years ago. 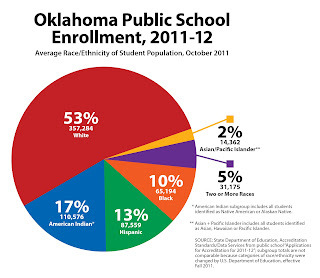 The 2011-12 data shows that Oklahoma’s student population is 53 percent white, 17 percent American Indian, 13 percent Hispanic, 10 percent black, 5 percent two or more races, and 2 percent Asian, Hawaiian or Pacific Islander. The state serves 39,772 four-year-olds in prekindergarten programs with 26,390 in full-day Pre-K classes. 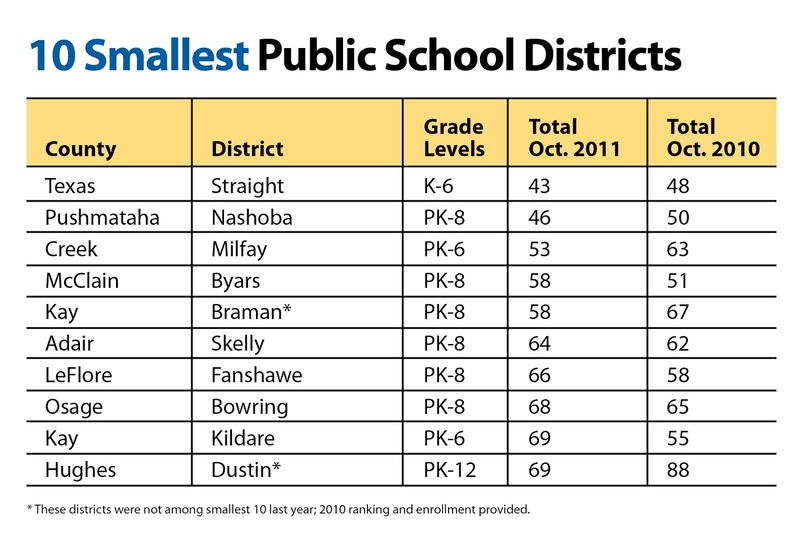 This year, about 96 percent of students are in full-day kindergarten. 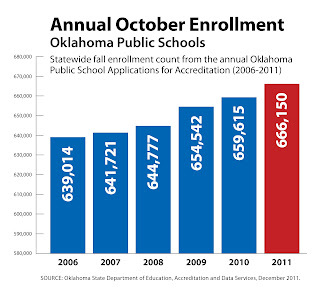 As part of the Achieving Classroom Excellence Act of 2005, all Oklahoma public schools are required beginning in the 2012-13 school year to offer full-day kindergarten programs unless they qualify for an exemption. 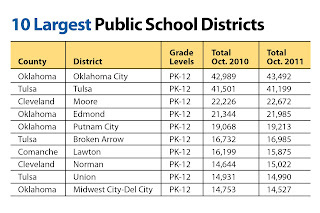 The largest school districts in the state remain Oklahoma City Public Schools, with an enrollment of 43,492 students, and Tulsa Public Schools, with 41,199 students. 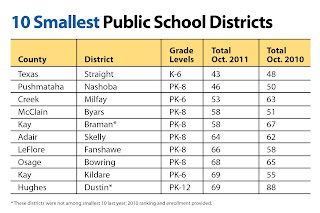 The top 10 districts ranked by enrollment size shuffled a bit this year, with Norman surpassing Union to take the No. 8 spot, leaving Union and Midwest City-Del City in the No. 9 and No. 10 spots, respectively. 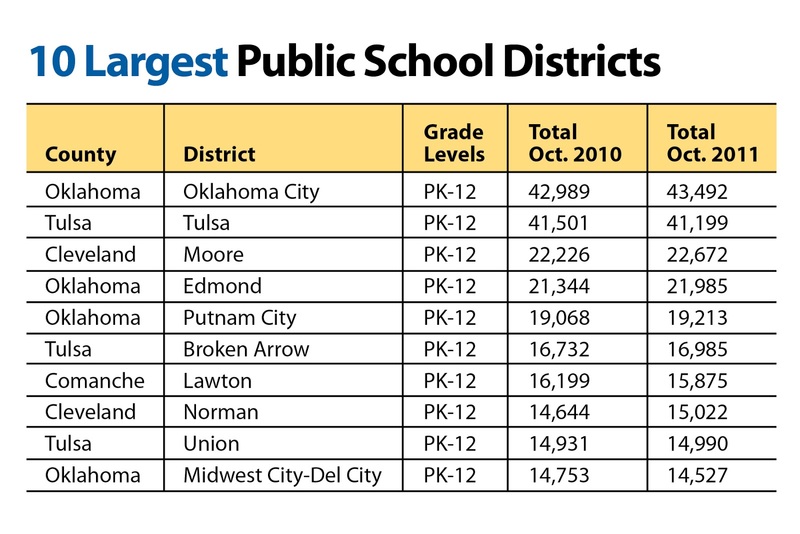 Tulsa, Lawton and Mid-Del were down slightly in enrollment numbers this year. Found Causes Episode 01 from DALE EPPERSON on Vimeo. Found Causes is a weekly television series that features people who serve the community by actively getting involved in the lives of people in crisis. Visit the Found Causes website. OKLAHOMA CITY –Oklahoma Insurance Commissioner John D. Doak expressed grave disappointment Wednesday that Oklahoma’s request for a waiver on Medical Loss Ratio requirements from the U.S. Department of Health and Human Services was rejected. Announcement of the rejection came yesterday from Washington. “This decision could lead to a massive disruption of our insurance markets in Oklahoma,” Doak said in response. The Medical Loss Ratio (MLR) in essence is a calculation of what percentage of each policyholder dollar is spent on delivering benefits or improving care, versus how much is spent on administration and profits. The Patient Protection and Affordable Care Act (PPACA) has set an 80 percent minimum MLR for companies doing business in the individual and small-group health insurance markets; an 85 percent MLR for large-group plans. Oklahoma Insurance Department in September sought a gradual phase-in of the 80 percent ratio in the individual market only, rather than immediate and strict enforcement of those targets by the Department of Health and Human Services (HHS). No changes were requested by Oklahoma for the small-group and large-group markets. Noting the disproportionate and potentially damaging effect of the high MLR on certain smaller companies and the possible impact in particular on Oklahoma’s rural communities, Doak requested that insurers be required to meet a 65 percent MLR for 2011, 70 percent in 2012 and 75 percent in 2013, with full compliance with the 80-percent standard for individual policies by the time the bulk of PPACA’s provisions are fully in force in 2014. Meeting MLR requirements should be easier for much larger carriers, which can spread the cost of administration over a vast base of policyholders. 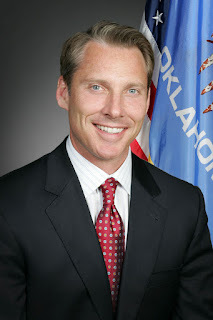 Conversely, Doak believes certain smaller companies might be forced to comply with PPACA’s MLR provisions by reductions in force that destroy Oklahoma jobs, meanwhile limiting consumers’ access to the counsel of licensed agents and decreasing the availability of customer service to policyholders. Some small companies might decide to leave the Oklahoma market altogether, surrendering progressively larger segments of the market to one or two major carriers and reducing consumer choice. 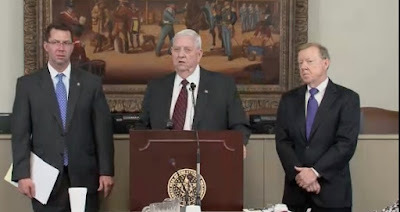 OKLAHOMA CITY – Oklahoma’s economy quickened the pace of its recovery during 2011, State Treasurer Ken Miller said yesterday as he released the state’s monthly gross receipts report. Miller said December was the fifth time in the past eight months that collections rose by more than 10 percent over the prior year and marked the 22nd consecutive month of growth. “Twelve-month collections now stand more than $1.3 billion higher than in February of 2010. Since we hit the trough almost two years ago, more than 68 percent of the revenue lost from our peak in December 2008 has been recovered,” he said. 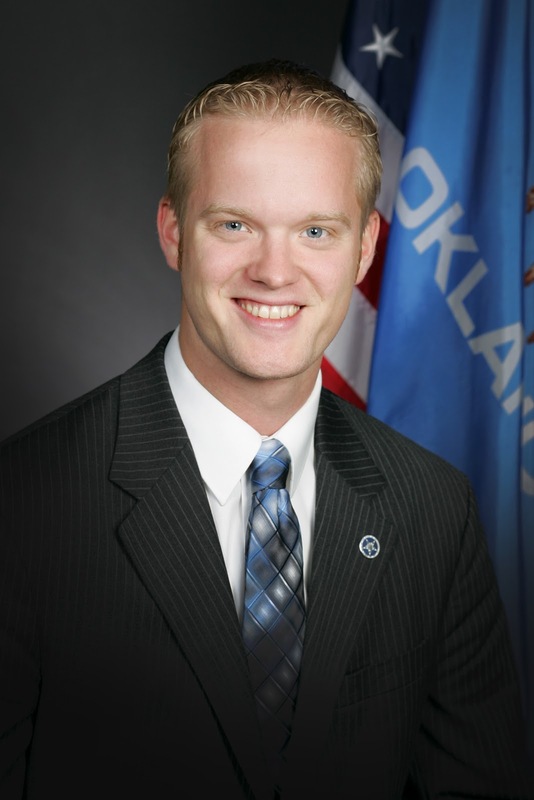 Miller said sales tax collections indicate a happy holiday shopping season in Oklahoma. December collections, reflecting sales between mid-November and mid-December, were $20.42 million or 6.3 percent higher than the last Christmas shopping season. National and state-specific forecasts point toward continued economic improvement. Recent Bureau of Labor Statistics data list Oklahoma with year-over-year employment growth of three percent, surpassing all surrounding states. The closest competitor was Texas with growth of 2.2 percent. A U.S. Chamber of Commerce report shows Oklahoma with the nation’s fourth lowest unemployment rate, adding jobs 3.5 times faster than the national rate in 2011. During the past 12 months, figures from the Oklahoma Employment Security Commission and Bureau of Labor Statistics show the number of jobs grew by almost 16,500, while the labor force grew by just more than 3,000. During that time, the unemployment rate dropped from 6.9 percent to 6.1 percent. Nationally, The Conference Board reports consumer confidence grew in December from the month before and now stands at levels not seen since April. Closer to home, the Creighton University Economic Forecasting Group anticipates Oklahoma in 2012 will have the second highest growth in gross state product in the nine-state Mid-America region at 4.6 percent. North Dakota is forecast to grow at 6.8 percent. 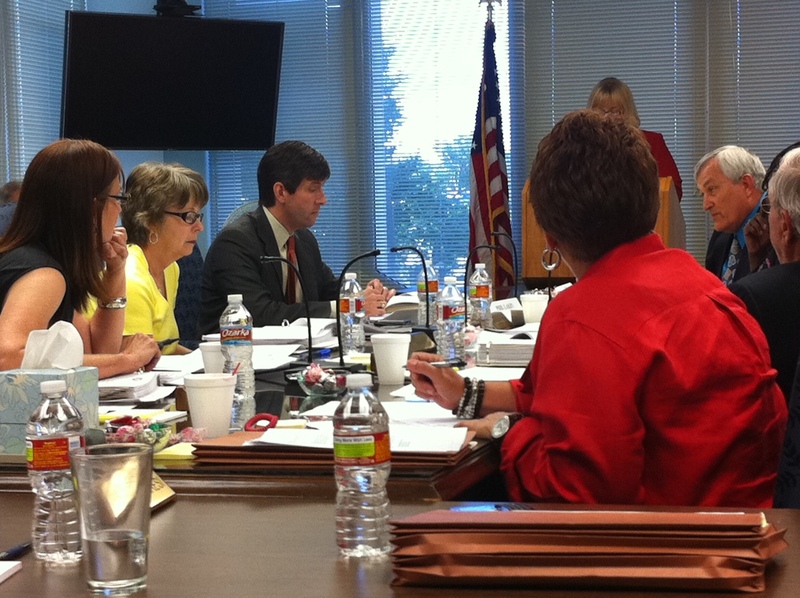 Oklahoma City—The Commission for Human Services met this evening and approved changes made by the Contingency Review Board (CRB) to a settlement agreement in the DG vs. Yarbrough case, a federal class action civil rights lawsuit involving Oklahoma’s child welfare system. The settlement agreement was originally approved on December 20 by the Commission and Children’s Rights, a child advocacy group representing children in the state’s foster care system in the lawsuit. The CRB reviewed the settlement and approved it with changes on December 29 which caused both sides to revisit the agreement again. Children’s Rights also signed off on the CRB’s changes to the settlement which now heads to federal district judge Gregory Frizzell for approval. House Speaker Kris Steele, R-Shawnee, who voted to approve the settlement during a Contingency Review Board meeting last week said the agreement is a golden opportunity to improve the agency under Oklahoma’s terms. Commission Chairman Brad Yarbrough said in a statement after the commission meeting that the Commission believes the approved settlement is in the best interests of the Department of Human Services and the children and families it serves. “The agreement provides a realistic framework to make improvements in the delivery of child welfare services and, as a result, better protect vulnerable children,” Yarbrough said. Under the agreement, compliance will dissolve on December 15, 2016 provided the state complies in “good faith” with the proposed improvements for two consecutive years prior to that date. The proposed improvements must still be developed but involve targets for identified practice areas named in the agreement. 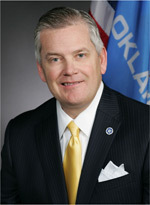 Howard Hendrick, Director of the Oklahoma Department of Human Services, said the agreement is unique for a lawsuit of this nature. “It is the first time a class action civil rights lawsuit involving a state child welfare system has been resolved without a consent decree,” Hendrick said. “Both sides were willing to entertain a new approach to resolving class action civil rights claims involving child welfare systems. The future improvements, the details of which must yet be developed, are outlined in a framework that both sides hope will satisfy our shared desire to meet the needs of vulnerable children and families. The settlement agreement identifies areas of practice improvements where OKDHS will focus attention. The details of these areas will be incorporated into a plan that will be developed by the agency over the next 55 days. By March 30, 2012, OKDHS will present a plan to a newly created panel. The agreement provides for a panel of three national child welfare experts who will have total access to DHS and agency staff. Yarbrough said other national consultants will be called upon to help the agency create the plan and to meet the goals contained in the future plan. Under the agreement, compliance with the agreement is based on the “good faith” standard, not the “substantial compliance” standard normally involved with consent decrees. “The Commission recognizes the difficult tasks faced daily by our child welfare staff and their commitment to professionally serve children and families,” Yarbrough said. “ But, the Commission also understands that too many Oklahomans have been dissatisfied in their dealings with the DHS. We view this settlement as an opportunity to help our staff help create better outcomes than we have previously achieved. Steele commented that the real work can begin now that the agreement has been finalized. “The Legislature must be involved in this planning process and I’m pleased it will be,” Steele said. “DHS belongs to the public and serves the public, so it is critical for the public’s representatives to have meaningful input. We’re fortunate to have had a special House DHS working group in the field these past few months scrutinizing every aspect of DHS and looking for improvements. It’s proven productive already, as they now have a head start on much of the work that must be done in the coming weeks. Hendrick mentioned several areas where improvements are needed. “We are all committed to continuous quality improvement. We will continue to make improvements even after compliance with the future plan has been completed,” said Hendrick. “[W]e need to recruit and expand the number of non-kinship homes for children coming into foster care. We need a broader array of therapeutic homes for children experiencing trauma and dealing with behavioral challenges. We also want to reimburse foster parents at better rates for their dedication to caring for Oklahoma’s abused and neglected children. “As an agency, we need to support our talented child welfare staff. We know this work is intensive, stressful, and demands people with critical thinking skills. As a state, we should value this work with pay that reflects the level of responsibilities expected of these workers. The state will be liable for the plaintiff’s attorney’s fees and expenses in an amount which will require court approval. Class members may not opt out of the settlement and the agreement settles any individual claims they may have.